My husband and I have been grilling fools lately. We've been grilling baked potatoes, brussel sprouts, burgers, and lotsa chicken. 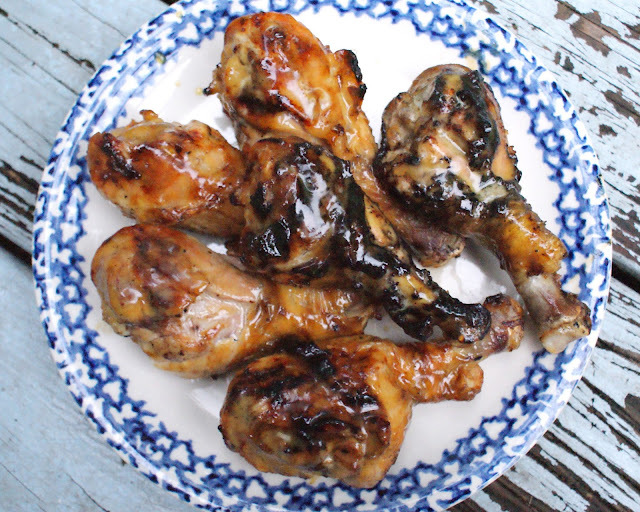 The boneless chicken breasts (which are my husband's preference when it comes to chicken) have been outrageously priced lately at our local grocery store, so I've started buying more leg quarters, thighs and drumsticks. I had some honey mustard leftover from the meal I made using the Cooking Planit app, and I knew it would be amazing paired with some grilled chicken. I was right! These drumsticks were perfectly delicious! I used the honey mustard as a marinade and as a basting sauce for this recipe, but it's also amazing as a salad dressing or veggie dip. It's fab! In a small bowl, whisk together the honey, dijon mustard and mayonnaise. Sprinkle the chicken evenly with the salt, pepper and garlic powder. Place the chicken into a large Ziploc bag and pour half of the honey mustard sauce into the bag. Set aside the remaining honey mustard. Seal the bag and shake it around until all of the chicken is coated. Refrigerate for at least an hour. Preheat your grill to medium heat. Grill the chicken for 10-15 minutes, or until juices run clear, turning every 5 minutes to ensure even cooking. Baste with the reserved honey mustard during the last 5 minutes of cooking. Keep an eye on it so it doesn't burn! Source: Honey Mustard recipe from Cooking Planit. wow! very nice recipe. Great blog. Your blog is interesting and so informative. Wait for your next blog post. Thanks for sharing with us.